We do our best to act responsibly and with regard for the environment. Our business works because we use as few resources as we can. Fewer resources mean less waste. We simply couldn't afford to offer you such low prices if we were wasteful or inefficient. That's why we reward the team at our Production Hub for reducing waste and we pay bonuses to anyone in our family who has an idea on how we can work more efficiently. All paper used at our production hub is responsibly sourced from sustainable sources and well managed forests. We have a wide range of recycled paper options across our range of Letterheads, Leaflets, Business Cards and Flyers - some 100% recycled, some 50% recycled. Any paper we can't avoid wasting is compacted and recycled and we separate all other waste into seventeen distinct streams for recycling or reprocessing. We use vegetable-based inks, pumped straight from large drums, rather than smaller cartridges in wasteful packaging. Our printing plates are recycled and used chemicals are disposed of responsibly. 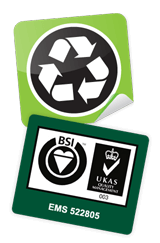 Our Production Hub's Environmental Management System has been assessed by BSI and we're certified for ISO 14001, the Environmental Standard. That means an independent auditor keeps an eye on our environmental objectives and the progress we're making with our targets. We're also certified for ISO 9001, the Quality Standard. We make it our business to be responsible about the way we run our business. It's important to us that we have complete regard for th eenvironment and still produce quality that's on time for our clients. We think being as efficient as possible is the right way to be. If you have any questions about our environmental policy, get in touch.